Prince Aleksander, would-be heir to the Austro-Hungarian throne, is on the run. His own people have turned on him. His title is worthless. All he has is a battletorn war machine and a loyal crew of men. Leviathan combines several elements that you’re likely going to be hearing a lot about from me: alternating POVs, historical events, and steampunk! If you’re not sure what steampunk is, you can learn about it at steampunk.com. The amazing illustrations (by the wonderful and talented Keith Thompson) make this an especially great starting point for steampunk newbies because they may help readers more accurately picture what various technologies are supposed to look like. The plot of Leviathan focuses on two very different WWI-era teenagers: British common girl Deryn and Austro-Hungarian prince Alek. Instead of historical Axis and Allied powers, the Austro-Hungarians and Germans are “Clankers” and the British are “Darwinists.” The Clankers are so named because they wage battle with steam powered machinery loaded with ammunition (steampunk! ), and the Darwinists’ war machines are fabricated animals. Essentially this means that the Darwinist powers fuse different parts of animal’s bodies together using scientific methods. Much of the story takes place upon the Darwinist airship Leviathan, which was made using the body of a whale. The first of our narrators to set foot on the Leviathan is Deryn “Dylan” Sharp, a brilliant and ballsy airman…who’s actually a girl. She risks her older brother’s position within the air force and even her own potential imprisonment by masquerading as a boy in order to pursue her dream of becoming an airship pilot. Deryn is tough and hilarious, often making quippy observations like this one: “Barking hard work, being a boy!” I can only imagine. Meanwhile, Alek has just been forced to flee the only life he’s ever know in the wake of his father’s assassination, using a dilapidated Clanker machine as his means of escape. The only remnants of his old life are his companions: his nemesis, Count Volger and his mechanics teacher, Master Klopp. I initially found Alek to be pretty annoying, due to his general haughtiness and seeming obliviousness to the plight of the average citizen. However, as his literal journey across Europe takes him to unknown places, so too does his personal journey; by the time our narrators lives finally intersect, Alek has found his footing. One of my favourite aspects of the whole novel was the subtle examination of the tensions between the Darwinists and the Clankers, both during peace and war-time. Ideologically the two groups are separated: Darwinists seek to employ modern scientific methods and natural materials in their technological progression, while Clankers want to advance mechanical engineering to improve current technologies. It is only at the novel’s climax, when the two concepts are fused, that the perfect machine is created. Teamwork, people! Teamwork. 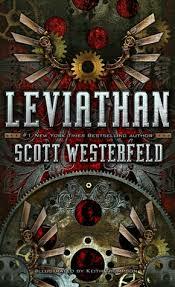 Bottom line: you need a lil’ steampunk and a lot of Scott Westerfeld’s Leviathan in your lives.